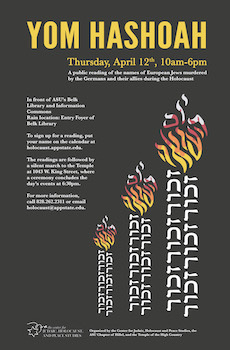 On Thursday, April 12, Yom HaShoah (Holocaust Memorial Day), the Center for Judaic, Holocaust, and Peace Studies along with Appalachian State’s Hillel chapter and the Temple of the High Country and will organize a public reading of the names of European Jews murdered by the Germans and their allies during the Holocaust. This reading is scheduled to take place from 10:00 am until 6:00 pm in the outside square between ASU’s Belk Library and the University’s Bookstore in Plemmons Student Union (rain location: Belk Library's Entry Foyer). After the readings, participants and other campus and community members will walk in silence to the Temple of the High Country (1043 West King Street), where a ceremony that encompasses the lighting of candles and the saying of the mourner’s Kaddish will conclude the day’s events, starting at 6:30 pm. ASU students, staff, faculty, members of the Temple and the Boone community at large are invited to sign up for one of the ten-minute reading slots ahead of time and participate. We hope that many members of the ASU and Boone communities will participate, linger and contemplate for as long as they like, and join us on the silent march and the ceremony at the Temple led by Hillel President Marisa Fernandez and members of the Temple. 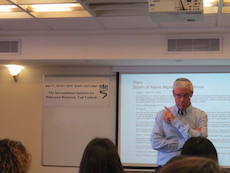 This year, the Center also co-organizes the Yom HaShaoh events with the help of colleagues from Yad Vashem, the World Holocaust Remembrance Center, in Jerusalem and the Campus Outreach Lecture Program of the United States Holocaust Memorial Museum's Jack, Joseph and Morton Mandel Center for Advanced Holocaust Studies, supported by the Leonard and Sophie Davis Fund. The events starts on the evening of Wednesday, April 11, with a public lecture by Eliot Nidam, the Head of the Academic Affairs Section of the International Institute for Holocaust Research at Yad Vashem. His talk is entitled “Living with the Other: Religious Congregations in France and the Hiding of Jews During the Holocaust.” It will begin at 7:00 pm in the Blue Ridge Ballroom 201 AB, Plemmons Student Union's Summit (2nd floor).